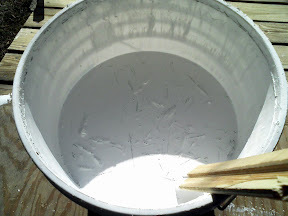 The weather was perfect today (almost 70), so I decided to make some progress with painting (priming) the shed. But unfortunately, it had been very cold here recently and when I opened my bucket of paint there was ice in it. So, I had to wait a little while until the sun warmed it up. it was also quite warm here today. 20 degrees. I didn't even have to wear mittens. virginia tech is looking better and better, although their weather over there is different than ours.